Posted on 5th November 2018 at 5:15 pm. Once again, workplace stress is in the headlines as the number of people suffering continues to grow. Last month, I blogged about how embracing new technologies in the workplace could provide a golden opportunity to improve workplace wellbeing. I touched on Digital Disruption and Digital Transformation as I highlighted research that claims adopting AI in the workplace will give workers back two weeks a year. The more reading I do, the more I am convinced this is the way forward for any business wanting to improve workplace wellbeing. But as I read, it is clear there are a lot of terms being bandied around that could be confusing and get mixed around. Zandra Moore, CEO of Panintelligence, talks about the use of “mind-boggling language which confuses people and is a barrier to working together” and I think her point is valid across all industry sectors. So, in this blog, I am going to try to define some of the phrases and buzzwords you might come across. On the face of it, using digital technologies to change the way you do business. It also includes applying new business models and the aim is to affect the value proposition of existing goods and services. Or, how can you do what you’re doing now in a different way that will make you more profitable. Digital Disruption can be applied to a single area of the business or the whole business – for example moving from ledger books or excel spreadsheets to cloud based software for your accounts is a digital disruption; as is the adoption of the Platform Economy (think Uber). Essentially, what happens to the business when a digital disruption takes place. But it is so much more! Digital transformation needs to be cultural for digital disruption to be truly effective. 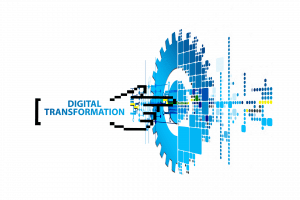 It encompasses “organisational activities, processes, competencies and models to fully leverage the changes and opportunities” I think the most important part of digital transformation is the cultural aspect. I am sure I am not the only person who has worked for a company where the CEO has decided to make a digital leap, believing it will benefit the company and employees, without ever really instigating the cultural shift that is needed to ensure successful adoption of the technology. This is part of the digital transformation. It could be described as the automation of repetitive work, tasks, processes, workflows and even decisions. Successful digital business automation requires the task, the workflow, whatever to be completely broken down and examined from end to end. It’s really important to think about the impact of each automation on the rest of the process, workflow and business as a whole. As I said in Scalable Technology, there is no point in automating one part of your business if it means another part will not be able to cope with the increased productivity and you are not ready to address that at the same time. So you’ve weathered a digital disruption and completed a digital transformation! You’re good to go right? But what about your digital resilience? This is about your reversionary modes of operation. What happens if your tech goes down? There have been a few incidences recently of the banks grinding to a halt (very frustrating) because their “computers are down”. If that happened to you, would your business still be able to function? And if it couldn’t, what would the impact be on you, your customers and your employees? It’s definitely worth considering a fall-back system if it is something you can arrange. Depending on the size of your business, that might just be taking the information down with good old-fashioned paper and pen. If your systems are all cloud based, it’s making sure wherever your servers are they have a system to cover them in the case of, for example, a power cut. But what happens if the power cut is in your office? How much battery back-up time do you have for your electronic devices? How frequently do you back up your data? Do your employees know how to complete a task manually if absolutely necessary? Regardless of whether you are undertaking a digital transformation or not, these are all good questions to ask of any business and undertaking that risk management exercise is invaluable. Do you automatically think “robot” when you hear the term AI? For a lot of people, “Cybernet” springs to mind. But what does AI in the workplace mean? And what does it mean for jobs? The first thing to remind ourselves is that this is nothing new. Did you know that the first prototype industrial robots were actually used as early as 1961? I think there is a difference between a machine that has been programmed to do something (for example a robot that has been programmed to spot weld something to a car) and true artificial intelligence. Computers capable of learning in order to better carry out the task they were initially programmed to do, could provide a huge benefit and time saving within the workplace. We are already seeing the use of chatbots – and while they may have been stilted and struggled to understand everyday conversational terms in the past, things are changing. Robots are very successfully carrying out manual repetitive tasks in many environments – picking product off shelves, for example. Robots that can learn – AI bots – provide a plethora of opportunity that we should embrace. These AI systems will work alongside humans, not steal their jobs. AI will potentially make your job easier, quicker and possibly different. It does not mean there will be no jobs – how long has voice recognition software been around? Did it get rid of the secretary or PA? No – it made the job easier perhaps, but not redundant. The Davinci Robot has been around for a lot of years carrying out surgery with great precision but it will always need a guiding surgeon (due in part to the unique nature of every human body). AI is only as good as the data it is provided with to learn from. A great example of this and of how essential human sense checks are for any AI implementation is the Amazon AI recruiting tool that was eventually dropped when it proved to have a gender bias. AR adds digital elements to a live view. Simplistically, think about a furniture company allowing you to see how a sofa fits and looks in your living room; or being able to see what a new pair of glasses or hairstyle would look like on you. VR, on the other hand, is an immersive experience. Putting on that virtual reality headset really does block out the “real” world around you and take you to another place – or even dimension. My first experience called to mind training in laparoscopic surgery – looking at a screen to see what I’m doing with my hands instead of staring down at my hands and what they were touching. The training possibilities are endless. These are just some of the terms that I am reading in the various articles that cross my desk each day. I think some may be being used interchangeably (digital disruption and digital transformation for example) but the most important thing to focus on is the huge benefit any size business could realise from assessing the opportunities the digital world opens up for them. Roar Software offer a free, no obligation business systems review for anyone ready to explore how digital disruption can help their business to grow and improve workplace wellbeing.